I actually sensed there was something wrong last Sunday when I did a flight search through Air Asia's website. 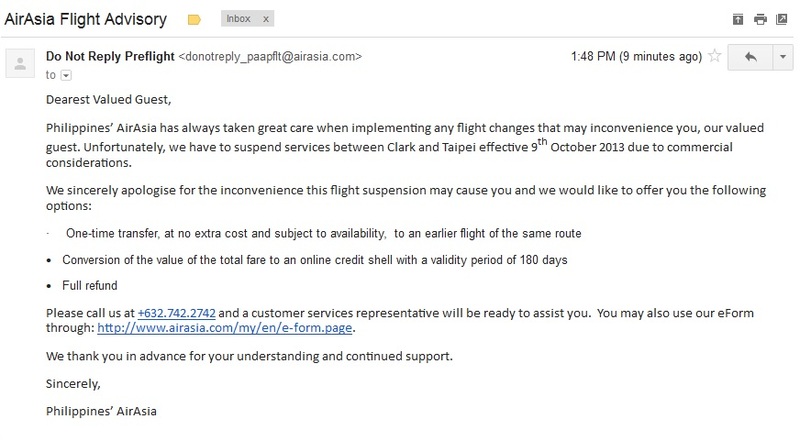 I didn't expect to be seeing this when all I wished for is a change in our flight schedule because obviously the new schedule (Clark-Taipei 8:35PM-10:35PM/Taipei-Clark 11PM-1AM) is just BAAAAD. In almost 6 years of budget traveling, flight delays/cancellations/changes are nothing new to me. I can't count how many times I've been a victim of these flight cancellations but most of the time, I get the best options in exchange. 3 years ago, I've blogged about the closing of Caticlan Airport and how our flight was transferred to Kalibo. Bad trip no? But I was able to move our flight to an earlier date to extend our vacation, for free. On our second trip to Boracay, Airphil Express suddenly cancelled their flights to Kalibo. They didn't move our flight to Caticlan but they transferred us to Philippine Airlines and was allowed to make some changes with our schedule. Better plane, better schedule, for free. Our flight to Kuala Lumpur last year was moved from morning to evening and we had it changed to a day earlier, for free. On our recent trip to Boracay just this month, our flights to (via Cebu Pacific) and from (via Pal Express) Kalibo were both rescheduled. And guess what? I had our flights transferred to Caticlan, for free. Air Asia's Clark - Taipei route was just launched December of last year. They had a seat sale last January for October flights, and since it's my BF's birthday month, I jumped at the opportunity and got us RT tickets at Php 2120 each. Who would have thought that just after 8 months, they would suspend the service? This flight has actually been rescheduled 4 months ago. From the original schedule leaving Clark at 1205H, it was moved to 2035H. The return flight was also rescheduled from 1425H to 2300H. I was offered a refund, a credit shell for 90 days or a schedule change. I didn't want to cancel the trip so I just made some adjustments with the flight dates. Well I guess this time I'm not lucky. I've called Air Asia's customer service 2 days ago and confirmed that our flight was affected by the cancellation. I was in denial until today when I received this e-mail. It breaks my heart to cancel this trip. Aside from the fact that it will be our first trip to Taiwan, we planned to celebrate his birthday there. I couldn't move it to an earlier flight because we got other engagements and we haven't prepared our documents for the visa application. We already attempted to book through other airlines or just go to another Asian country but would cost 3 times more. So I think it's time to move on and just... get a refund wait for the next seat sale!!! In the meantime, I'll check Cebu Pacific for seat sales. 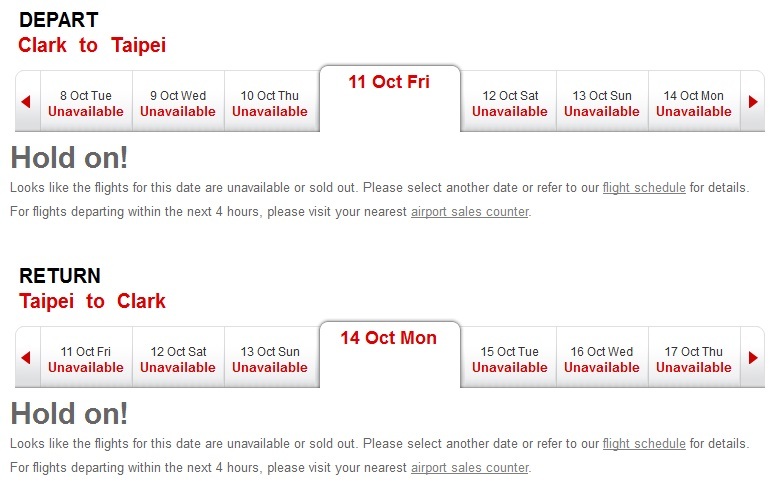 Philippines’ AirAsia will be temporarily suspending flights to Davao, Kalibo, Taipei and Hong Kong from Clark International Airport effective 9th October 2013.
there's a seat sale this 12nn at cebupac FYI. on a diff note, can you teach me how to show my IG pix in my blog? like yours (upper right)? thanks!